Welcome to one of the smallest yet most biodiverse countries in South America. 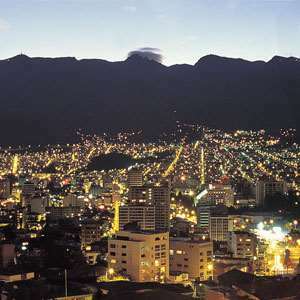 Ecuador offers a panorama of scenery and climates—from the Pacific Coast to the rainforest and the Amazon to the high slopes of the Andes. Your hotel is available for mid-afternoon check-in. Your included PRIVATE CITY TOUR showcases the Old Town, where colonial history still permeates the air, surrounded by beautiful architecture, and religious and cultural sites. One of the highlights is a visit to San Francisco Square, where you will see the La Compañía church, which has the most ornate and richly sculptured façade and interior. Afterward, visit the Old Town’s famous hill, Panecillo or “Little Bread,” where you will see the Virgen de Quito angel statue. Finish off your tour at a bustling Ecuadorian market. Today, experience the traditional ways of the Otavalo people. With your Local Host, visit Otavalo’s famous INDIAN MARKET, full of textiles, clothes, vegetables, and much more. Enjoy the drive here, as it passes the often snowcapped Cayambe Volcano. 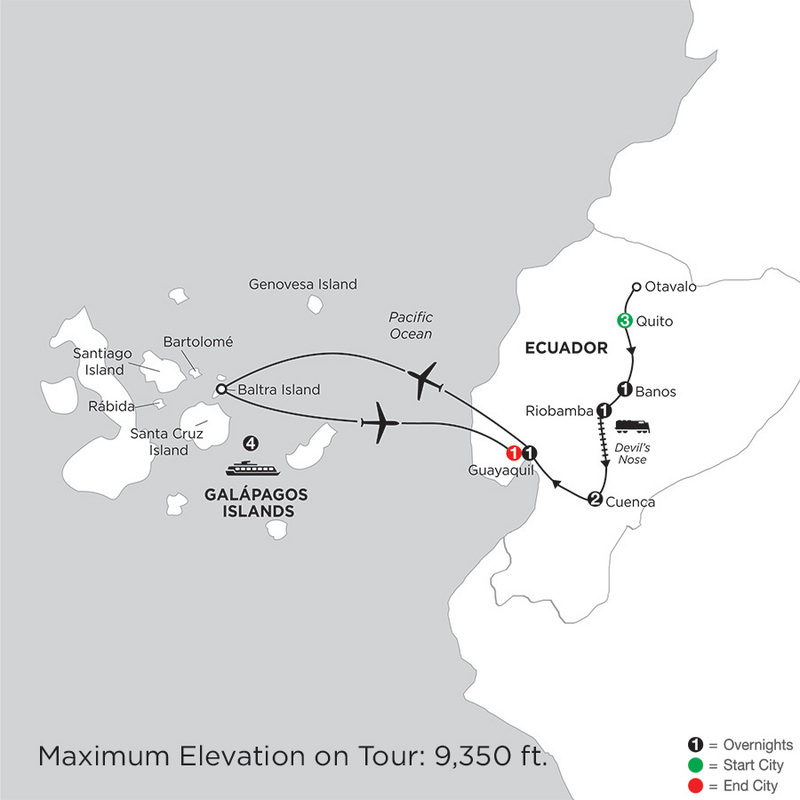 The Ecuadorian Line runs directly through the glacier of the immense volcano, which is the highest worldwide point on the Ecuadorian Line. Next, visit a local SCHOOL in Peguche to visit with Ecuadorian children. Enjoy lunch at a local hacienda before returning to Quito. Journey south with your Local Host, passing the Avenue of the Volcanoes to visit COTOPAXI NATIONAL PARK, a highland zone protected since 1975. On a walk near Lake Limpiopungo, you will have the chance to learn about the typical vegetation and fauna found in the area. Enjoy breathtaking views of Cotapaxi Volcano, rising more than 19,000 feet. Next, visit a ROSE PLANTATION, where you can observe the cultivation and harvest of this important export and witness the exceptional beauty of the Ecuadorian rose. Continue to Baños, known for its famous hot springs that give the area its name. Relax in the mild mountain climate at one of the HOT SPRINGS at your hotel. You’ll have time this morning to view some of Baños’ impressive waterfalls before heading to Riobamba in the shadow of Ecuador’s highest volcano, Chimborazo, surpassing 20,000 feet in altitude. An unforgettable TRAIN TRIP takes you over the almost-vertical wall of rock called the Devil’s Nose. This engineering marvel allows the train to transit a zigzag path cut into the mountainside that ascends and descends more than 3,000 feet. Continue to Cuenca with your Local Host, stopping at the INGAPIRCA RUINS, Ecuador’s most important monument of pre-Spanish culture. The ruins are located on a grass-covered hill once used as a sun-worshiping temple. Even before the construction of the Sun Temple (1450-1480), this place held important spiritual significance for the Incas. On a walk through the ruins, learn about Inca beliefs, rituals, and how they built the puma-shaped temple. Enjoy a PRIVATE GUIDED TOUR of Cuenca, the third-largest city in Ecuador and considered one of the most beautiful. See the historical buildings along the Tomebamba River, the Todos los Santos ruins, the flower market, and the main square with the old and new cathedral. Afterward, visit a PANAMA HAT FACTORY and a POTTERY STUDIO, where you can learn more about the work of the local people. Transfer with your Local Host to the coastal town of Guayaquil, stopping along the way to visit a CACAO PLANTATION. Learn about the cultivation of the cacao fruit, harvesting, and the processing of this important industry for Ecuador. On to Guayaquil, Ecuador’s largest and most industrial city and the key to Ecuador’s trade center. The rest of your day is at leisure to explore the city. Disembark at the north shore of SANTA CRUZ ISLAND for a visit to a TORTOISE RESERVE in the highlands. Here, you will see and learn about the Giant Galápagos Tortoises living in the wild and what is being done to help preserve these ancient creatures. Later, fly to Guayaquil. As outlined in the day-by-day itinerary and private airport transfers to/from intra-vacation flights; intra-vacation flights not included. This historical estate, surrounded by the volcanic mountains of the Ecuadorian highlands, is a charming and welcoming place to overnight during your visit to Ecuador. From the hotel lobby to your uniquely furnished guestroom, you'll enjoy the antique feel and the surrounding nature that characterizes this hotel. Great service, food and a relaxing ambience paired with superb views make the Hacienda Leito a true gem. Hacienda Leito sits among the majestic mountains of the Ecuadorian Highlands, where every day is an experience with nature. Surrounded by volcanos, wildlife, and striking scenery, this hotel makes for a memorable stay in Banos. Guestrooms are rustic, cozy and feature unique décor, with modern amenities, a wood-burning fireplace, and a private bathroom. Hacienda Abraspungo, with its comfortable, charming and high level installations offers a personalized service in the ideal spot to enjoy the peace and beauty of the Andes. The architectural style offers traditional colonial design often used in the ancestral mansions and haciendas of Ecuador. Adorned with old photographs and illustrations of Andean landscapes, the hotel has a richness unlike any other. The wonderful Hacienda Abraspungo is located at 2,754 meters above sea level and is surrounded by the magnificence of the Ecuadorian Andes. It is named after a glacial valley which is situated between the Chimborazo Volcano and Carihuairazo, in the exact center of Ecuador. Abraspungo has cozy rooms with garden views, flat-screen cable TV, premium bedding, a private bathroom, and free Wi-Fi. Colonial design and embellishments surround you at every turn at the Hotel Carvallo, making you feel like part of its history. A fantastic city location paired with great service and modern, spacious accommodations make this hotel as memorable and enjoyable as the city itself. Colonial elegance and a distinct European flare set the Hotel Carvallo apart from others in the city. Situated close to Cuenca's attractions, guests can enjoy the history of the area and be reminded of it every time they step into the hotel. Rooms at Carvallo are styled with elegant furniture and a jewel toned palette of lush fabrics. Ceilings feature elaborate decorations, and each room features superior bedding, private bath, minibar, and cable TV. The Unipark Hotel Guayaquil sits directly in the heart of the commercial and cultural district of the city. Providing easy access to Guayaquil's highlights, parks, the riverfront, and nearby historical sites, this is the perfect place to settle in during your journeys. The hotel also offers ideal amenities, facilities, and first-class international cuisine. Located in the heart of Ecuador's most populous port city, the Unipark Hotel offers guests convenient access to all the city has to offer. Its prime location provides the perfect spot from which to explore Guayaquil's unique tradition of trade as well as the many attractions, public squares and parks. The 140 air-conditioned guestrooms at Unipark Hotel include all the amenities you'd expect to make you feel more at home. Recently updated, they offer internet access, flat screen TVs and a nightly turndown service. Hotel Samari Spa & Resort is set in a charming colonial-style house with an inner patio, surrounded by lush gardens. The hotel's charm is further accented by exposed brick walls, a gabled roof, and rich wood furnishings. Rooms are furnished with comfortable bedding, private bathrooms, and windows that open to the outside world. Relax after a day of traveling at the hotel spa, offering several beauty treatments, massages, and a heated pool. Guests will also love the local cuisine at the hotel's restaurant, with specials inspired by the diverse culinary diversity of Ecuador. Be sure to relax and have a cocktail at the hotel's authentic tavern (located in a former monastery) that will transport you in time, or visit one of the many bars throughout the gardens. Exquisite scenery, expansive gardens, and a lofty position in the mountains of Baños make the Hotel Samari Spa & Resort one of a kind. All 37 rooms boast jetted tubs and offer free WiFi and balconies. Other amenities available to guests include pillowtop beds with premium linens, TVs, and minibars. A turn of the century Mansion, completely restored is transformed in a luxury boutique hotel, in order to satisfy the most discriminating traveler. Mansión Alcázar is set within the historical downtown of Cuenca on Bolivar Street. Personalized service is given not only upon arrival, but also in the intimate Le Bar and Casa Alonso Restaurant, where you can enjoy a drink and the best gourmet cuisine in town. Mansion Alcazar is located in the heart of the city of Cuenca, Ecuador, which was selected as one of the few World Cultural Heritage Cities by UNESCO in 1999 as a result of community efforts to restore the splendid beauty of years long passed by. Room decor evokes the style of the old century, with careful selection of antique, fine furniture and artwork. Each room features antique wood furnishings, private bathroom, air-conditioning, cable TV, and free Wi-Fi. A five-time winner of the World Travel Awards, the Oro Verde offers an exquisite combination of European experience and Ecuadorian hospitality. The hotel is conveniently located, tastefully decorated, and offers a unique and full list of amenities, making your stay in Guayaquil as easy and comfortable as possible - while still adding a touch of elegance. The Oro Verde hotel in Guayaquil is draped in elegance and sophistication - where European service meets Ecuadorian hospitality. With its ideal downtown location, easy access to cultural & historical sits as well as shopping and entertainment, it is the ideal place to settle in for your time in Guayaquil. Drive into the old Colonial city during the evening for views of the romantic plazas and the impressive public and religious buildings followed by dinner. 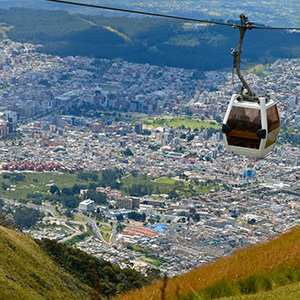 Take a ride in the highest cable way in South America and get to know this amazing city, Quito, in a totally different way. 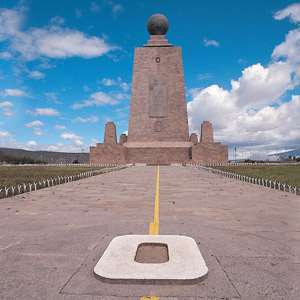 Travel to the Equatorial Monument which marks the exact Middle of the World, latitude 0, where you can stand with a foot on each hemisphere. On this Guayaquil city tour, get to know the most interesting parts of this tropical and busy metropolis. On this Guayaquil city tour, get to know the most interesting parts of this tropical and busy metropolis. 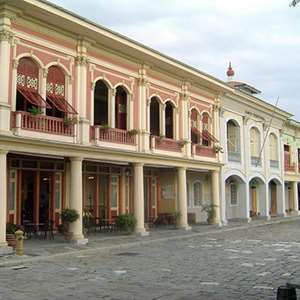 Following the city tour, you will visit the municipal museum which displays the rich history of Guayaquil. On this city tour, get to know the most interesting parts of this tropical and busy metropolis including the Historical Park which showcases a wildlife exhibit and re-creations of urban and rural areas of Guayaquil dating back to the 1800's. Monograms provides travelers access to a Local Host®, so you will have someone on hand to answer those vacation questions pertaining to Cuenca. No waiting in line at the concierge desk or trying to ask your waitress at breakfast directions to the shopping district. Simply ask your Local Host® about Cuenca and you'll be on your way in no time. Plus, your Local Host® will share local Cuenca insights and share suggestions for getting off the beaten path, leaving you more time to create lasting vacation memories that are yours alone. I always liked to travel and that is why after finishing high school, I decided to study tourism administration. While I was studying at the University, I started to work as a tour guide and found it very interesting. Being a tour guide allows me to meet people from many different places and it took me to incredible places. For a period of time I moved to Argentina where I taught Spanish and English but I missed my family and country, so I decided to come back to Ecuador. When I came back to Quito, I worked as a Key Account Executive for a tour operator, which was a great experience for my career, but after a time, I decided to be a tour guide again. I realized I enjoy being with people outside in the nature more than working in an office, and I am able to have more time for other activities I like, such as painting and working with the children of my church. This city river separates the colonial section of Cuenca from the more modern homes. It’s great for a stroll in the day or evening. You can grab a little picnic and sit on the banks, while you enjoy the sounds of locals, music playing, and the rushing water. There are even a few spots where you can grab a beer and take it all in. Be sure to visit this main square as it is the center of action in Cuenca. Brilliant for people watching, relaxing with a book, strolling around the gardens, or grabbing a bite to eat. At the cathedral on the square, you can pay a nominal fee to climb to the top for impressive views of the city. It’s a great way to spend an afternoon or evening. If you have time and you appreciate religious architecture, be sure to make a stop in this cathedral. The lighting, the ceiling frescos, sculptures and the old pipe organ will have you marveling. It’s dripping with history while well-kept at the same time. People rave about the unique art experience here. As part of an old nunnery, this little gem houses some of the best religious art in Cuenca. Even for the non-religious, it’s a wonderful glimpse into the life of the early Cuenca nuns and the culture surrounding the city. It’s complete with gardens too! Monograms provides travelers access to a Local Host®, so you will have someone on hand to answer those vacation questions pertaining to Guayaquil. No waiting in line at the concierge desk or trying to ask your waitress at breakfast directions to the shopping district. Simply ask your Local Host® about Guayaquil and you'll be on your way in no time. Plus, your Local Host® will share local Guayaquil insights and share suggestions for getting off the beaten path, leaving you more time to create lasting vacation memories that are yours alone. 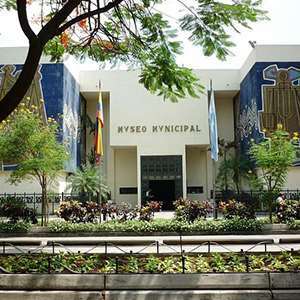 I was born, raised and educated in Guayaquil, Ecuador. I finished my education as an English teacher in Guayaquil, but I kept on studying as Tour Guide, graduated at the U.N.I.D.E.C. University from Riobamba and obtained my Tour Guide License. I worked with children as an English teacher in an elementary school from 1986 to 2012. Nineteen years ago I had the opportunity to work as a tour guide for the shore excursions provided to Norwegian Cruise Vista Fjord, and since then I discovered a wonderful job where I learned to know my country. Due to my high skills and responsibility I began to work as a tour guide. I love the Ecuadorian flora and fauna and I would like to be a specialized guide in bird watching in the near future. My great satisfaction as a tour guide has been incredible because I had the chance to meet people from other cultures and latitudes from around the world. The ascension to the top is a good little work out, although there are plenty of places to stop and rest along the way. Getting to the top, however, is well worth it. There’s a beautiful park at the top and views unlike anywhere in the city. Like the ugly duckling turned to swan tale, this once poor area was transformed into a prime tourist attraction – a 465-foot stairway flanked by colorful houses, eateries, gift shops and galleries. Bring water for the trip! This unique spot combines architecture, history, and wildlife. You can stroll around and view all the plaques that explain the buildings of this large museum, and then spend the afternoon with the animals in this well-kept facility with highly knowledgeable and friendly guides. Make sure to get there early enough to see it all! If you only have time to take in just a little bit of Guayaquil, this little stretch is the perfect place to do it. 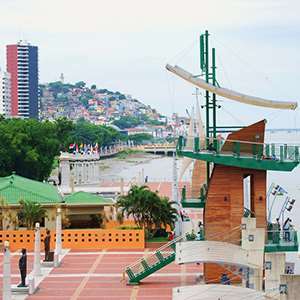 It spans about a mile and a half along the coast and offers little drink spots, occasionally has entertainment, and you can see the variety of Guayaquil’s architecture along the way. With offshoots into various neighborhoods that you can scope out at your leisure, it’s a great starting point for exploring the city. For a strange and fun experience, head to the city square that hosts hundreds of Iguanas, smack dab in the middle of the city. With the hustle and bustle and a cathedral as your back drop, you can stroll around for an hour or two and watch these funny and fascinating creatures along with other wildlife in the square. Something you will remember always! About a half hour outside of Guayaquil, Churute is simply amazing and a great way to spend half a day. You’ll have the chance to glimpse some species of monkeys, sloths, horned screamers, parrots, roseate spoonbills, rails, herons and so much more! The locals harvest seasonal mangrove crabs, and occasionally they’ll prepare crab meat empanadas right on site! Make sure to bring your insect repellant or mosquitoes may spoil your visit.